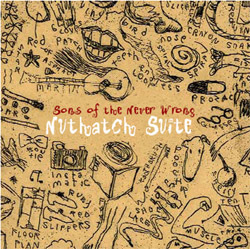 Sons of the Never Wrong"Nuthatch Suite"
Gadfly Records is proud to announce the release of "Nuthatch Suite," the fifth CD from quirky Chicago-based nouveau-folksters Sons of the Never Wrong. Showing yet again their uncanny ability to create unique songs and to perform them with a polished flair, "the Sons" deliver this stunning new release of insightful originals. Blending the best vocal elements of groups like the Mamas and the Papas and the Roches with a lyrical sophistication of Talking Heads, "the Sons" (Bruce Roper, Sue Demel, and Deborah Lader) are lively performers who hit their intricate harmonies as well on stage as in the studio. Writing and performing since 1993, they have already solidified a strong fanbase in their hometown, and instantly gain fans wherever they tour around the U.S.